Bhai Ghanaiya Ji also known as Bhai Kanhaiya Ji was born in a Badhavan (Dhamman) Khatri family in Sohdra situated on the bank of Chandarbhaga canal near Wazirabad in Gujaranwala district which now falls in Pakistan. His father Bhai Natthu Ram Ji was a very rich trader and according to Bhagat Singh Hira a Government contractor who supplied arms to the army of General Amir Singh, a courtier of the Governor of Lahore. His father and mother Bibi Sundri Ji were both very religious minded. As per these orders Bhai Ghanaiya Ji, who was involved in serving water to sangat also wore a sword. One day a Sikh asked him that if needed would he use that sword to kill the enemy. He answered that 'I will not kill anyone. If someone attacks me I will ask him to kill me with my sword which is my Guru's sword'. This dialogue reached Sri Guru Gobind Singh Ji who felt that Bhai Ghanaiya Ji's spiritual attainment was very high and that he was above worldly attractions and thus asked him to carry on his duty of serving water. The literal meaning of the word 'Ghanaiya is 'vaheguru'. As a child while leaving his home he would fill his pockets with (i) kaudies (small sea shells which at that time were used as the smallest coin (ii) dhelas (the price of the coin dhela was one half the price of one paisa) and (iii) paisas and distributed these to the needy persons. His parents encouraged him to be benevolent. At that time vagaar (forced unpaid labour) wherein poor people were forced to carry luggage without any payment to them was very common. One day a poor and weak person who had come to Sohdra in search of labour was unfortunately caught hold of by a Khan who asked him to carry a heavy bundle. Because of bodily weakness the poor man carried that bundle for some distance and then finding it too difficult to carry it further started weeping. At this the Khan mercilessly kicked him with his toes. The labourer stared wailing profusely. On hearing his wailing Bhai Ghanaiya Ji who was present in a satsang at a nearby place came rushing towards the labourer and not only carried his luggage but also gave him rupee one for his expenditure. The Khan stared at Bhai Ghanaiya Ji and asked him 'what is your relationship with this labourer? You have carried his bundle and also given him one rupee'. Bhai Ghanaiya Ji replied that 'all of us are the sons of God Almighty and as such all of us are brothers. My relationship with him is the same as my relationship with you. I have given him the money because he had come out here to earn some money for his livelihood'. Khan was wonderstruck to hear this and vowed not to engage anyone in unpaid labour henceforth. Even as a young child Bhai Ghanaiya Ji was fond of meeting hermits and sadhus and have spiritual discourses with them. He remained away from home for long hours in search of them. In 1660 AD he was hardly 12 years of age that he incidentally met Bhai Nanua Ji, who belonged to Wazirabad in the present day Gujranwala district of Pakistan. Bhai Nanua Ji is also known as 'Vairagi Nanua' or 'Nanua Bairagi' because he did not have any attachment with the worldly possessions. According to Bhagat Singh Hira Nanua Ji was a very short statured person with a hunchback who could travel only in a palanquin. The word "nanua' stands for a dwarfed sized hunchbacked person. But even travelling in a palanquin Bhai Nanua Ji wandered and visited far off places in search of hermits to receive some spiritual light. Bhai Nanua Ji lived for some time in Lahore and then went to Kiratpur Sahib which is at a distance of about 10 kms from Anandpur Sahib which falls in the present day Ropar district of Punjab. At Kiratpur Sahib he received the rites of a disciple at the hands of Sri Guru Tegh Bahadur Sahib. Bhai Nanua Ji's devotional songs which are composed in different classical measures in simple Punjabi language are very popular among the Sevapanthi sadhus. Bhai Nanua Ji stayed at Kiratpur Sahib for three months and during this period everyday he had darshan (holy glimpse) of Sri Guru Tegh Bahadur Sahib. One day Sri Guru Tegh Bahadur Sahib told Bhai Nanua Ji that Lahore was waiting to receive him. Bhai Nanua Ji immediately sat in his palanquin and left for Lahore. In Lahore Bhai Nanua Ji reached a garden and decided to stay there. The glowing face of Bhai Nanua Ji attracted many traders of Lahore who thought that Bhai Nanua Ji was a trader and had come to Lahore on a business tour. But Bhai Nanua Ji told them that he was not a businessman and that he was in search of such a great man who would give him spiritual peace. Bhai Ghanaiya Ji's meeting with Bhai Nanua Ji became a turning point in his life. Bhai Ghanaiya Ji's search for spiritual peace finally bore fruit because Bhai Nanua Ji's company eventually provided him a chance to have darshan (holy glimpse) of Sri Guru Tegh Bahadur Sahib. Bhai Ghanaiya Ji thus entered the fold of Sikhism. Soon thereafter Bhai Nanua Ji left for his heavenly abode. Bhai Ghanaiya Ji returned to his home in Sohdra. During this time his father also left for his heavenly abode. Being the eldest son he was expected to carry on the duties of his father. As such for the management of business affairs he was to go to Kabul along with the routine paraphernalia. On way to Kabul the group had not gone very far that they had to make a stoppage for the night. During the night Bhai Ghanhaiya Ji heard a voice from some far away place singing the hymns of Sri Guru Tegh Bahadur Sahib. He left his companions and went out in search of the source of that voice. Henceforth he roamed and roamed in places far and near in search of spiritual peace. During these travels sometimes he had to go without food for days together. After 24 days of wandering hither and thither he heard a voice saying 'You go to Anandpur Sahib' He was overjoyed and asked people as to where this place named Anandpur Sahib existed. 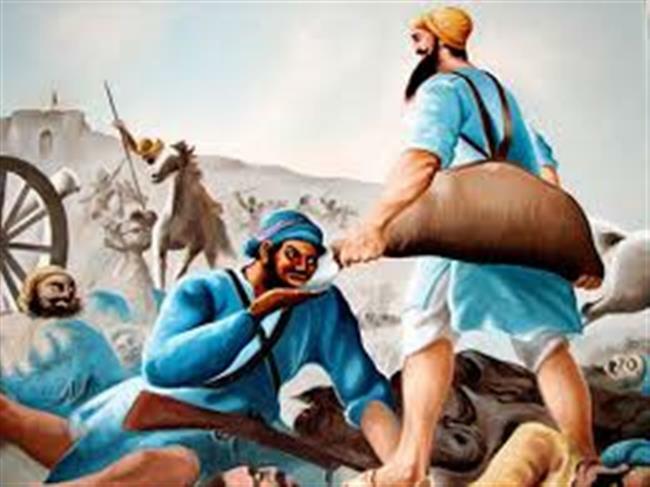 He learnt that everyday Sikh jathas (groups) passed by a nearby place to go to Anandpur Sahib. Thus, Bhai Ghanhaiya Ji finally reached Anandpur Sahib and was blessed with the darshan of Sri Guru Tegh Bahadur Sahib. On having a darshan of Sri Guru Tegh Bahadur Sahib his happiness knew no bounds. He was overwhelmed with spiritual peace. At Anandpur Sahib Bhai Ghanaiya Ji became a care taker of the stable where he took care of the horses and supplied fodder and water to the horses. During this time Sri Guru Tegh Bahadur Sahib visited the stable once in a while and thus he got some opportunities to have his darshan. Sri Guru Tegh Bahadur Sahib was very much impressed by Bhai Ghanaiya Ji's spiritual discourses. In 1674 AD i.e. after about one year of his seva (service) in the stable, he was blessed by Sri Guru Tegh Bahadur Sahib who asked him to leave Anandpur Sahib and search for a barren land and start a dharamsala (rest house for travellers) in the name of the Guru, where in addition to serving community meals to the travellers he should preach gur shabad (Guru's teaching). Guru Sahib's direction ended his wishful thinking of staying longer at Anandpur Sahib and he left Anandpur Sahib in search of a barren place. During the same year i.e. in 1674 going westward he came across a village named Kavha near a canal named Haro which was situated on a hilly mound. This village now falls within the city limits of Attock city in the present day District Attock of Pakistan. This village fell on the way to Peshawar and was without a source of water. The residents of this village had to walk a long distance with a great difficulty to fetch water from the canal Haro. This 3-4 miles distance to and fro was very slippery in the rainy season and very risky. In view of these factors in the village Kavha Bhai Ghanaiya Ji founded a dharamsala for the travellers in collaboration with the local people where irrespective of their religion or caste they could stay overnight. In the mornings and evenings reading gurbani (Guru's preaching), katha (explanation of gurbani), kirtan and religious discourses were a common feature. In November, 1675 he was greatly shocked by the sad news of the martyrdom of Sri Guru Tegh Bahadur Sahib. In 1678 AD he went to Anandpur Sahib to have a darshan of Sri Guru Gobind Singh Ji and stayed there to serve. During this period in view of the atrocities impinged by the hilly chiefs and the Mughals Sri Guru Gobind Singh Ji ordered all Sikhs to wear swords. As per these orders Bhai Ghanaiya Ji, who was involved in serving water to sangat also wore a sword. One day a Sikh asked him that if needed would he use that sword to kill the enemy. He answered that 'I will not kill anyone. If someone attacks me I will ask him to kill me with my sword which is my Guru's sword'. This dialogue reached Sri Guru Gobind Singh Ji who felt that Bhai Ghanaiya Ji's spiritual attainment was very high and that he was above worldly attractions and thus asked him to carry on his duty of serving water. Around this time the hilly chiefs, with the help of Mughal ruler had started invading Anandpur Sahib again and again. During 1702-1705 in the battles which ensued between Sri Guru Gobind Singh Ji and his enemies i.e. the hilly chiefs and Mughals Bhai Ghanaiya Ji served water to all the wounded soldiers irrespective of their religion. One day a Sikh complained to Guru Sahib that Bhai Ghanaiya Ji was serving water to the enemies i.e. the wounded Muslim soldiers also. When Guru Sahib asked Bhai Ghanaiya Ji about this, he replied that 'in the face of every wounded person I see only my Guru's face'. Impressed by his spiritual attainment Guru Sahib gave him ointment and asked him that in addition to serving water he should also undertake first aid of the wounded soldiers. Thus during 1702-1705 Bhai Ghanaiya Ji continued this service and during the battles at Anandpur Sahib he served water and applied ointment to the wounds of the soldiers irrespective of their religion. As such he can be said to be the founder of Red Cross 160 years before it was formally founded in 1864 AD at a convention at Geneva by Henry Dunant. Sri Guru Gobind Singh Ji blessed Bhai Ghanaiya Ji and asked him to found his own sampardai (sect) which is now known as 'Sevapanthi' sect. When Sri Guru Gobind Singh Ji left Anandpur Sahib Bhai Ghanaiya Ji returned to his dharamsala at Kavha. Thus Bhai Ghanaiya Ji founded the Sevapanthi sect as per the directions of Sri Guru Gobind Singh Ji. How Seva Ram Ji happened to become the next incharge of the Sevapanthi sect is quite interesting. In 1683 AD at Sohdra one day a cheater sadhu dressed in white clothes had collected silver coins and silver ornaments from the residents of Sohdra with the pretext of converting them to gold. Bhai Seva Ram Ji dressed in white clothes happened to be walking at a short distance. The cheater sadhu pointed towards Bhai Seva Ram Ji and told the villagers that his disciple is coming and will help him in converting the silver coins into gold coins. The cheater sadhu immediately ran away and the people got hold of Bhai Seva Ram Ji. The tussel ended by inviting the local administrator who immediately imprisoned Bhai Seva Ram Ji. Incidentally the same evening this local administrator had invited Bhai Ghanaiya Ji for dinner. As soon as Bhai Ghanaiya Ji saw Seva Ram Ji dressed in white clothes like a sadhu he asked him as to who he was and what had brought him there. He narrated the whole incident and said that he was in search of him and other hermits like him. But by pointing towards me the cheater sadhu ran away and the people caught hold of me. At Bhai Ghanaiya Ji's request the administrator immediately released Bhai Seva Ram Ji. As already mentioned above after Bhai Ghanaiya Ji left for his heavenly abode in 1718 AD Bhai Seva Ram Ji became his successor. In 1698 Bhai Ghanaiya Ji established another dharamshala at Nurpur Thal (Pakistan). Bhai Ghanaiya Ji eagerly wanted to go on a parchar (preaching) campaign to spread the message of Sri Guru Nanak Dev Ji. During this tour he took Bhai Seva Ram Ji along with him and over a period of six month they covered long distances. After this tour they returned to Kavha dharamsala. How Bhai Noori Shah Ji became the second disciple of Bhai Ghanaiya Ji is also quite interesting. An Afghani Muslim Noori Shah was a soldier in the Mughal army who during the battles at Anandpur Sahib had been revived to life by Bhai Ghanaiya Ji who had poured water into his mouth and applied ointment to his wounds. After becoming healthy Noori Shah started to search for his benevolent life saver. After many trials he finally reached the Kavha dharamsala. Bhai Ghanaiya Ji immediately recognized him. Noori Shah offered a very valuable diamond to Bhai Ghanaiya Ji as a token of his gratitude. Bhai Ghanaiya Ji resisted his offer again and again but he finally handed over that valuable diamond to Bhai Ghanaiya Ji. Bhai Ghanaiya Ji threw away that diamond in the nearby canal Haro. Noori Shah was enraged and asked Bhai Ghanaiya Ji to either keep that diamond himself or return it to him. He said that otherwise, he would kill himself with his own sword. Seeing Noori Shah's anger Bhai Ghanaiya Ji asked the canal Haro to return the diamond to the Shah because he did not want him to die. The canal got divided into two parts and in the middle on top of a mound a heap of valuable diamonds appeared. Bhai Ghanaiya Ji asked Noori Shah to pick up as many diamonds as he wanted. Noori Shah fell down at the feet of Bhai Ghanaiya Ji and apologized. Bhai Noori Shah Ji started living in a hut near the Kavha dharamsala. After Bhai Seva Ram Ji, Bhai Noori Shah Ji became the second successor of Bhai Ghanaiya Ji. Until 1947 AD this hut was present and his descendents were Sikhs and followers of Bhai Ghanaiya Ji. Balbir Singh in his book Lammi Nadar has mentioned about a Muslim faqir (saint) who was a descendent of Bhai Noori Shah Ji living near Rishikesh near the bank of Ganges who was propagating Sikh religion. In the morning of the day that Bhai Ghanaiya Ji was to leave for his heavenly abode, a few of his followers were discussing the methods of eliminating the dead body. In that discussion Bhai Ghanaiya Ji said that the easiest method is to immerse the dead body in some running water because it was very inexpensive and also the body could provide food to the water animals. The same evening when the kirtan programme was going on Bhai Ghanaiya Ji did not ask the musicians to end up this programme which he usually did. The programme continued for a very long time and when Bhai Ghanaiya Ji did not move even when the programme ended, his followers, to their astonishment found that he had left for his heavenly abode. When Bhai Ghanaiya Ji left for his heavenly abode as per the arguments given by him in the morning programme the hermits immersed his dead body in the Chandarbhaga canal flowing near Sohdra. But thinking that relatives of Bhai Ghanaiya Ji may dislike their action they left Sohdra and reached the Kavha dharamsala. The relatives became angered at the action of the hermits because they wanted to cremate the body in the traditional manner. They sent many chobbas upto twelve kohs but they could not find his body. When the sad news of Bhai Ghanaiya Ji's demise reached Bhai Seva Ram Ji he started singing a hymn of Sri Guru Arjan Dev Ji which is at p. 1000 of Sri Guru Granth Sahib which includes the line 'Sewak Di Orrak Nibahi Preet' which means that 'the sevak's (servant's) love continued upto the end'. It may be mentioned here that two books Parchi Bhai Kanhaiya and Parchi Bhai Seva Ram include information about the life of Bhai Ghanaiya Ji. Parchi Bhai Kanhaiya is a biography of Bhai Ghanaiya Ji, founder of the Sevapanthi sect. Written in Bhakha sometimes between 1728 and 1740 when its author Bhai Sehaj Ram Ji happend to be staying with Bhai Addan Shah Ji, another leading Sevapanthi saint, the work was edited by Bhai Hira Singh Mahant Ji and published in 1966 by the Sevapanthi - Addanshahi Sabha, Patiala It includes 20 sakhis (anecdotes) relating to the life of Bhai Ghanaiya Ji. Parchi Bhai Seva Ram is a biographical sketch in Punjabi verse of Bhai Seva Ram Ji, who led the Sevapanthi sect after the death of Bhai Kanhaiya Ji. Written by Bhai Sehaj Ram Ji, himself a renowned Sevapanthi saint this book written perhaps towards the close of the 18th century was edited by Bhai Hira Singh Ji and published by the Sevapanthi-Addanshahi Sabha, Patiala. Bhai Seva Ram Ji, a disciple and close associate of Bhai Ghanaiya Ji preached the Sikh way of life in distant parts of the country. Because Bhai Seva Ram Ji and Bhai Addanshah Ji were the prominent followers of Bhai Ghanaiya Ji the sect founded by Bhai Ghanaiya Ji is known as 'Sevapanthi' sect and 'Addanshahi' sect. According to Parchi Bhai Kanniya and other sources Bhai Ghanaiya Ji preached bhala (do good to everyone), bhulla, to forget the bad deeds of others and bhana i.e. accepting the Will of God. He preached to be merciful towards the animals. He forbade eating of meat. At Anandpur Sahib, distt. Ropar, Punjab in the fond memory of Bhai Ghanaiya Ji two Gurdwaras have been established. (i) One of these is Gurdwara Seva Sthan Bhai Ghanaiya Ji. 'Seva Sthan' means the place where he rendered service. This is situated near the Railway Station, Anandpur Sahib at the place which was the battle field during the battles fought by Sri Guru Gobind Singh Ji against his enemies and where Bhai Ghanaiya Ji served water and provided first aid to the wounded soldiers. (ii) The second Gurdwara is Gurdwara Baolian Bhai Ghanaiya Ji which is situated in the village Mohiwal adjoining the city of Anandpur Sahib. 'Baoli' means a well with steps leading down to the water level. In this Gurdwara the Baoli Sahib from which Bhai Ghanaiya Ji fetched water by going down several steps is intact and even now there is water in it. In this Gurdwara the large size mashak (leather bag) used by Bhai Ghanaiya Ji to carry water from the Baoli Sahib to the battle field is intact. In this Gurdwara the dol (pail) with which Bhai Ghanaiya Ji fetched water from Baoli Sahib is intact. All these things are shown in the five pictures being attached herewith. This year, being the 300th Anniversary of his Akal Chalana is being observed on September 20, 2018 all over the world. During September 18-20, 2018 a wide variaty of religious programmes will be organized in the two Gurdwaras situated in Anandpur Sahib. During this period the Sikh Jathas from different parts of India in the form of nagar kirtan (marching while singing the holy hymns from Sri Guru Granth Sahib) will arrive at Anandpur Sahib to pay their homage to Bhai Ghanaiya Ji, a great benevolent Sikh. Dhan Dhan Bhai Ghanaiya Ji!